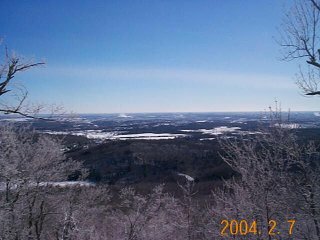 Gatineau Park is located just North of Ottawa, Ontario, in the Province of Quebec. The park is very large (363 km2) and thus has many access points. We started at Parking Lot 7 (Kingsmere). Nice, bright sun for most of the day. Temperature was -15 oC or so in the morning, but warmed up to about -8 oC by midday. The snow was absolutely perfect - very fast and no bare spots at all. We started off with Swix V20 Green, but soon switched to Swix V30 Blue wax. My good buddy Matt McLean came from Perth today to go skiing in Gatineau Park. It was the first time either of us had been to Gatineau, and also the first time either of us had skiied this season. Matt got to my place in Ottawa at around 9am. We were soon on the road headed toward the Province of Quebec. We crossed the mighty Ottawa River, and were soon passing the entrance to Gatineau Park. However, we planned on going to Parking Lot 7, in order to avoid most of the green (easy) trails that started at the main entrance. After arriving at P7, we unloaded all our gear, and waxed up our skis. We purchased our trail pass ($9) from the attendant, who was sitting on a chair. We wondered why they wouldn't have a little booth to keep them out of the cold and wind. The view from Trail #6 Almost immediately, the trail went up. I mentioned to Matt that they seemed to have a lack of flat trails, and he remarked that they were called the Gatineau Hills. After the first major climb, we came to the first lookout point. We could see for quite a ways, and the city of Ottawa was in plain view. We were both quite impressed with the view, and the fact that we were on the highest point for a long way! Shortly after another bit of a climb, we started to descend. This is where the wipe-outs started. Matt lost his sunglasses on either the first or second fall of the day, and even though he went back to look for them, never did recover them. We stopped at the Shilly Shally cabin for lunch, which was a great little cabin with a woodstove and tonnes of dry, split wood waiting for us. There was a few people about, but it wasn't overly busy. We had a good lunch, and dried out some of our clothes by the woodstove. After lunch we continued on our way, checking out quite a few of the backcountry trails in the vicinity of Parking Lot 7. The trail map we had was quite good, and showed the type (Shared, Diagonal Stride Only, or Backcountry) as well as the difficulty (Easy, Difficult, Most Difficult). We generally followed the Most Difficult Backcountry trails, but ended up sampling quite a few different types by the end of the day. We found that the "Shared" trails were really well groomed--about 10m wide in some places, and a wide, smooth skating trail in the middle, and at least one trackset lane going each way. The backcountry trails on the other hand, were narrow and not as well packed. They are perfect for the type of skiing that I prefer. In the end, we spent about 4.5 hours in the park, including breaks and lunch. Our route (outlined below) totalled approximately 17kms. As we were heading down Trail 30 towards the parking lot, we stopped off at the lookout before continuing down the hill. After we were ready to continue, Matt headed down the trail. However, another skier came from above very fast, and almost ran straight into Matt. Neither of us saw him coming until the last second, as he was flying! Luckily, he was well in control, and quickly veared to his left and headed down the other trail. Before I even comprehended what happened, I looked where he had gone, and he was almost out of sight! Wow.. crazy! At the bottom of the hill, I told Matt that he had almost died, and he agreed! Thank god that unknown skiier was paying attention and was in control--man I wish I could ski that well! Anyway, both Matt and I were seriously impressed with the quality and quantity of trails, and in fact everything about the whole experience! After getting back onto normally painted Ontario streets (What the heck is with these Quebec street markings? ), we made our way to the Running Room and MEC to look at gear. Matt and I both spent some money we shouldn't have. Then we went out for some dinner at Monkey Joe's with Leo. Overall, a fantastic day, and I can't wait to do it again! 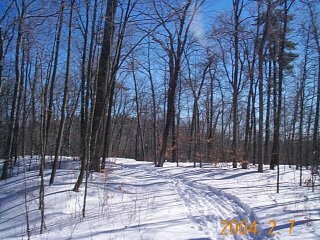 The National Capital Commission has both a free Summer Trails (.pdf file) and Winter Trails (.pdf file) map available for the park. There is also a General Park Map (.pdf file) available. You can buy an excellent trail map (more detailed than those above) at many local outfitters, as well as at the Visitor Centre. It is available in paper and tyvek, and is very useful. 1:50,000 Natural Resources Canada topo maps of the area, 31 G/12 (Wakefield), 31 F/9 (Quyon), and 31 G/5 (Ottawa) from Toporama.